Remember how badass Sigourney Weaver’s Aliens battle suit was back in ’86? Edge of Tomorrow remembers it, along with a few other things about that movie and others, weaving all its inspirations into an entertaining slice of summer escapism. As Lt. Col. Bill Cage, Tom Cruise is also battling aliens, albeit from a safe distance. Earth has been invaded by “mimics,” and Cage never met a TV talk show he didn’t see as a perfect chance to flash a handsome smile and sell the merits of a war that someone else will fight. Until, that is, he’s suddenly fitted with his own super suit and made part of a doomed mission. After dying, he wakes up back at boot camp, reliving the same events over and over, death after death, until he can figure out how to break the time loop. Cage’s first step toward an answer is meeting Rita (Emily Blunt), a celebrated war hero who admits she not only knows his story, she’s lived it. Cruise’s latest is the smart sci-fi adventure that his last so badly wanted to be. Though Oblivion did boast more truly eye popping visuals, Edge of Tomorrow scores with sharp writing, crisp direction, vivid imagination and one damn good co-star. Truly, Blunt classes up any project, from awful (The Wolfman) to awesome (Looper) to in-between (The Five Year Engagement). Here, she not only gives Cruise the strong female counterpart his movies often lack, she makes Rita the strongest personality, and the film is better for it. For his part, Cruise shows some welcome range early on as a cowardly chickenhawk, slowly falling back into autopilot mode the more Cage becomes battle-hardened and heroic. Either way, his charm never wavers. The team of screenwriters gives a sleek adaptation to Hiroshi Sakurazaka’s novel “All You Need is Kill.” Yes, we’ve seen these elements before, but the film carries a wise self-awareness about the familiarity, and is even able to toe the line between questioning the folly of war and respecting the sacrifice of soldiers in battle. Director Doug Liman (Go/The Bourne Identity/Fair Game/Mr. and Mrs. Smith) again proves he knows his way around an action scene. Moreover, he handles the “Groundhog Day” transitions skillfully, injecting some humor and varying scene structure so that the repetitive events don’t feel repetitive. 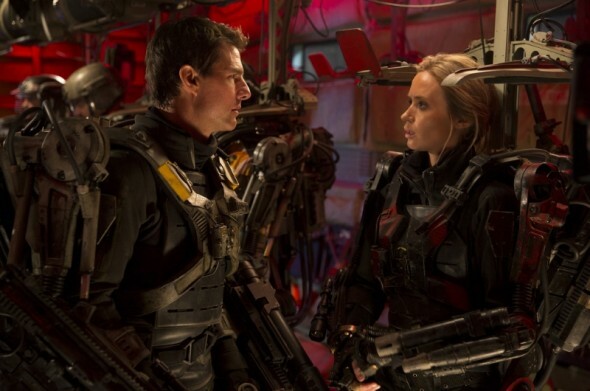 Look past the isn’t-that-the-name-of-an-SNL-soap-opera-parody title, and Edge of Tomorrow delivers.